It’s a funny thing, motivation. It seems to come and go, depending on the chaos of life, your energy level, your time and maybe even the state of your workspace. I’ve had several weeks here where I feel like I haven’t sewn a single thing, and it’s odd to me. There are a lot of things being juggled right now, but I have plently of time to spend in my studio. Why then, do I come upstairs, look around, and not feel like working on a single one of my projects? I have quilts, shirts and dresses in the works and an unheard of number of supplies to play with. I can’t seem to find it in me to dive in though. I tried forcing it a little bit, and I finally finished Rob’s shirt from Christmas, just to get it off my table and into our closet. There are overdue baby gifts stacked up, patterns asking to be cut and plenty of fabric that is prewashed and ready to go. This usually happens to me about once a year, and this year it’s caught me when I have a lot of work I should be doing. I want to find the energy to pick up and get going again, but I can’t always remember how I re-energized myself the year before. What do you do to find inspiration to dive back in to your projects? This isn’t the same thing for me as feeling overwhelmed with options. 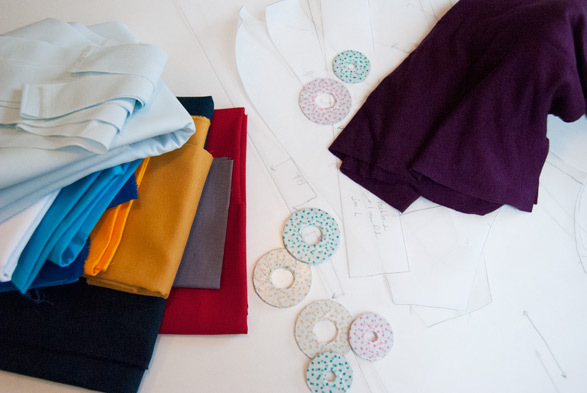 I’ve written about that before, and how I think a fabric stash can stifle your creativity. This is about finding the inspiration and energy to get going again after taking a break; to find the joy again in cutting, stitching and sewing until late into the night. Many times for me, I have to completely step away from working. No computer, limited time on my phone, and no sketching or picking through my fabric bins helps me to miss it. I’ll get an itch in my brain to create something and I make it sit there and simmer. Often times, once I sketch something in a notebook, it disappears from my head. It’s as if my brain lets the idea go once it’s on paper, because now I don’t have to try to remember it, to think of the pocket details or the way the neckline will fall. I don’t like the lapse though. I feel sluggish and frustrated with myself. I don’t want to take a sewing break, and I don’t want to take a blogging break, but I can’t seem to get myself back in the game. 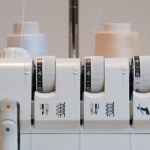 Is it better to force yourself to sew in these situations? Is it the habit of sewing daily something that I need to re-establish? I picked up a book at the library today that I’m really looking forward to reading. It’s The Creative Habit by Twyla Tharp. I believe that I saw somewhere that Sarai from Colette Patterns was reading it, and it sounded like an applicable title for what I need right now. I’ll let you know if it gives me any insights into motivation and keeping up creative practices. So far, the first chapter is proving to be right on target. This entry was posted in General, Life and tagged inspiration, sewing on May 16, 2014 by Amy Alan. I hear you on this one! I often burn out after Christmas, but this year it hit me hard int he spring. Way too many commitments and no energy to put into sewing! TBH, I’m still not quite back on track. I did officially take a couple weeks off blogging, which gave me some mental space to think about sewing without stressing about photographing or writing about it! Hope you get your mojo back when the time is right! Oh Christmas gets me good! I managed to stay away from the post-holiday burn out this year by not sewing anything for anyone. It was hard to stick by that, but I’m really glad I did! Thanks for the encouragement! I think it’s coming back little by little. I’m going to look for a pattern or project I can get excited about and hope that does the trick. Oh man, I hear you! 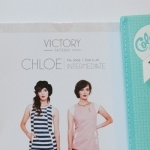 I go through bouts where I don’t feel like sewing… or cooking, cleaning, showering…! It can be so overwhelming sometimes when you have lots to do. I try to give myself tiny bits of work to do when I’m not feeling it (“Tonight I’m going to sew the side seams and nothing else”) and I’ll usually feel lik doing more. Also, just looking through my fabric and patterns usually gets me wanting to sew again! Yes! I hear you! Don’t feel like sewing? Then you probably don’t even want to get dressed in the morning! Hahaha! Aww, I know how you feel, Amy! I call it losing my creative mojo. As we know it DOES come back, but I think you have to let it return naturally – forcing the issue usually just leads to errors, blah projects, and more frustration. I just eventually get the urge and usually start by making up my mind what I will work on and doing the little things to prepare: gather supplies, select fabric, press fabric, cut fabric. That whets my appetite. 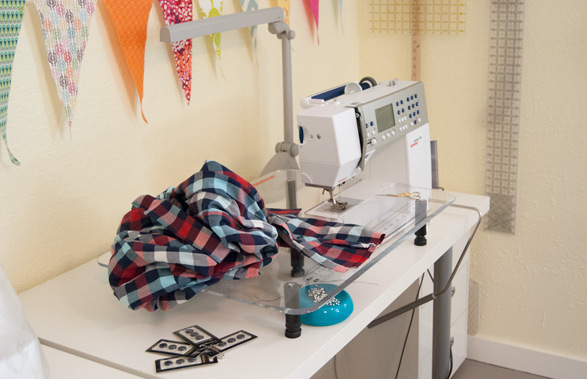 Starting is the hardest part but then once I’m going and in the groove – don’t bother me, I’m sewing! Lol! Inertia, I guess, hard at work either way! A mental and physically break is a natural, good thing I believe, to refuel and recharge the creative engine. You’ll be back – the only hard part is I miss you so darn much! That’s what I’ve been doing, trying to force it. I do end up frustrated! My brain tells me I’m just being lazy, especially when I compare my productivity to someone else’s. Bad idea! Haha! Ginger had the same suggestion, of starting with one tiny task. I think I’m also going to look for a pattern or new fabric that gets me excited to sew again. I think I’m tired of looking at the same ole’ fabrics. I read Twyla’s book a few years ago, and she doesn’t wait for inspiration. Instead, Twyla sticks to a schedule, a rythm, that puts her in a place to allow for creativity. It’s a beautiful story and I’d like to thank you for bringing it to my remembrance. I’m stuck at the beginning stages of exploring a new venture as well as re-exploring some others. Aha moment: place myself there! Hi, Ann! I’m kind of getting to that place in Twyla’s book. I really like that she has a box for each project to go into. I realized that with my most successful projects, I do this same thing. I started a filing system for some of my bigger summer writing projects and I’m already feeling better about things. I also like the idea of sticking to a better schedule. Her way of having you evaluate your creative inspiration and daily schedule made me realize that I have a lot of habits that get in the way of being productive. I’m excited to keep reading! I do have these moments too, but they come from my day job. No motivation, lack of energy, etc. Then my sewing room always offers a healing therapy… and life goes on. Motivation seems like a wave for me. Thank you Amy for this meaningful post and the link for the book. 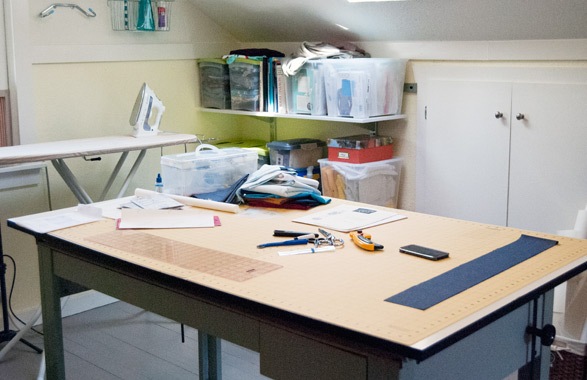 It’s funny- my sewing room used to be refuge for me after work as well, even when my job was sewing! I think it was because in my own space I have control over the entire project, with no one putting in their own ideas to change what I’m doing. I need to do a bit of shifting in my day so that I can have a time when I “clock-out” and am no longer “working”, even though I’m in the same space. It’s hard! Glad I’m not the only one! I have gotten in that state, and after feeling unbelievably guilty for several days, I reminded myself that if I were still working, I would be taking vacations. I want sewing to be fun, not a job. So I force myself take a vacation of a week and then don’t even feel guilty walking through the room because I’m NOT THERE! hah. I come back refreshed and ready to start again. Oh I know that guilty feeling well! The hard part is, sewing is my job, but ALSO what I do for fun. With reading Twyla’s book, I’m recognizing that I need to make a better distinction of when I’m working and when I’m playing. Also, taking a vacation from your hobbies is great! Sometimes you just need a mental break from your projects. I like to get outside and hike. It clears my head and makes me more energized for when I get back to it. I had surgery 2 1/2 years ago, and I came out of it feeling like in addition to cutting the cancer out of me, they also cut the creativity out of me. It’s been a long, long road back. I will say, though, even when I have stacks of WIPs, sometimes the excitement of starting something totally new will then carry over into finishing something previously started. I like to alternate new and existing. But – for me, anyway – trying to force it just ends up with me feeling terrible. I once sat motionless in my studio for four hours overwhelmed with the pressure to do something, and even the desire, but with a crushing lack of creativity. I know for you this is also your livelihood, but try not to let the joy of it be eliminated, either. I hope you’re doing well after your cancer surgery, Melissa! I’m sure that took an unbelievable amount of energy from you, and it makes sense to me that you say you feel it took away your creativity. I’m sure that being exhausted from the healing process left you drained. I really like the idea of starting something new to get excited about my “old” projects. I’m going to the fabric store tomorrow to try to find something really fun and easy to get back into the groove. Yes! Forcing it is just awful. Sometimes I have to with deadlines, and I work sooo sloooowly when I have to do that. Eventually I have to have a mini dance party and promise myself ice cream or something once I finish it. It usually helps! I hope that your creativity flourishes as you continue to heal, my dear. Oh I’ve had this feeling so many times, I think taking a day or two off being creative usually helps, doing something else that’s fun & relaxing. Reading a good book, watching your favourite films & then look for a new fun project! Yep, I try taking time off, and I can’t stop telling myself that I “should” be upstairs working instead of reading. It’s not very relaxing! We have a day at the beach planned this week, so I hope that gets my mind off of everything and helps me feel refreshed. I do the same thing with UFO’s. It’s so much more fun to move on to the new exciting project sometimes! I’ll get patterns sized, altered and traced, and then never move on to cutting them out. It’s kind of ridiculous. Hopefully it gets better soon! I often use a timer to help me focus. I’ll set it for 15minutes and work until the timer goes off. No rush, just progress. Then I’ll set it again and go do something completely different. Then go back to my sewing for another 15 minutes. When I’m stuck the timer helps me get moving again. You’re very welcome and I hope it helps! I can completely understand how you feel… I am primarily a knitter and sometimes weeks past by and I have not knit a single stitch. The only thing that seems to work for me is force myself to knit. I know it sounds rough however what I do is make myself knit a round in a pair of socks. Just one, and put it down. And so the next day, and the day after that. My motivation doesn’t get back immediately however the fact that I have been playing with yarn and needles somehow activates something in my brain and then I found myself at work or grocery shopping dying to get home to knit. I try to force myself to sew some days, but I just can’t seem to do it! It makes me loath the project that I’m trying to work on. I think it’s because my mind set is that once I pick it up I have to keep going until I’m done though. I’m trying this method out again, and telling myself “you only have to cut out the pieces for one quilt block” or “just cut out this traced pattern and you’re done”, and finding that I want to keep working on things. It is helping a little bit! It’s also nice to know I’m not the only one. When I see people who post finished garments every-other-day on their blogs, it’s hard to not tell myself that I’m not doing enough, which actually brings on project avoidance for me. 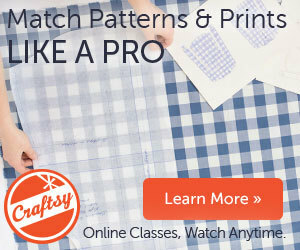 I think admitting that you’re burnt out is the first step to getting your crafting groove back!